(from Billboard Magazine September 13, 2013) Pop star Pink shines in Australia as she sells out arenas in the last leg of her tour, “Truth About Love.” Totals for the last week surpassed $31 million, which is less than half of what the end results are expected to be once the rest of the statistics come in. With over twenty shows for the Aussies during this leg, the tour will launch the diva to the top spot of the year’s highest-grossing touring artists. The pop princess made five city stops from June through September including two venues in Sydney, one in Brisbane, four nights in Adelaide, and eighteen in Melbourne which is a record. The Sydney Entertainment Centre hosted eight of the twelve shows in Sydney, while the Allphones Arena took the other four. Ticket numbers for both stadiums were an astounding 162,972. The Brisbane Entertainment Centre managed 98,264 tickets sold in its eight nights. 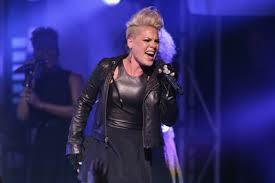 Pink wrapped on September 8th after quite the summer of sold out performances and 46 concerts in the country. Her final ticket tally for the last leg of twenty shows was 261, 236. In comparison, Marc Anthony in his “Vivir Mi Vida” tour makes number 3, raking in $6.2 million from five U.S. arenas on his world tour in North and South America that goes through December. The North American leg launched from Miami in late August. This Latin pop star, with the release of his album “3.0,” sold out the American Airlines Arena for performances in Miami to kick off the tour. He heard roars from over 29,000 fans for the two-night stint. Orlando also sold out, making the overall revenue more than $7 million for the first 6 North American cities combined. Anthony is booked until December 5th in Caracas before taking on Australia as well. Other acts to watch at the top of the grossing charts are Taylor Swift after five shows with over 84,000 tickets sold and $6.6 million in sales and Blake Shelton with over 58,000 tickets and $2.1 million in sales in three shows.